Ms. Paula L.Green, a New York City based freelance journalist is conducting these workshops. Ms. Green was a recipient of a 2003 Knight International Press fellowship, which is administered by the International Centre for Journalists in Washington D.C. The main objective of the workshop is to update the local journalists in Colombo and outstations in developing their skills, sources said. 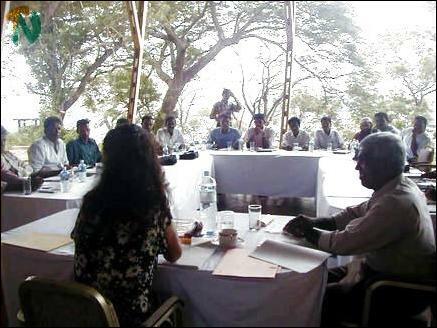 In Trincomalee, about twenty-one journalists attended the workshop, which was held in Welcome Hotel. Trincomalee journalists attend the workshop. Trincomalee journalists seen with, Ms. Paula L.Green , US Embassy Information Officer, Ms. Cody Taylor, and Information Assistant ( Tamil), Mr.Eustace Fernando, after the one day workshop.